Printed by Tho. Johnson for the author, and are to be had at his house in White Fryers, 1670. The Atlas Japannensis is the oldest book owned by the Lisa Sainsbury Library. 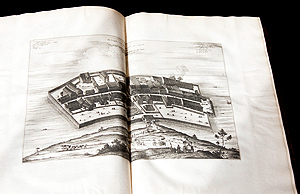 The original Dutch version was published in Amsterdam in 1669. 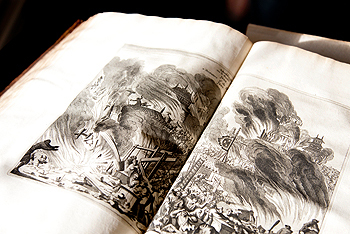 In the same year a German translation was printed, followed by a French and English translation in 1670. 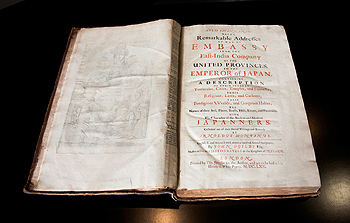 The Atlas Japannensis owned by the Lisa Sainsbury Library is a copy of the English version published in 1670, during the reign of Charles II who had become King of England after the restoration of the monarchy. Fearing colonization by Western powers, the Tokugawa shogunate prohibited Spanish and Portuguese ships from entering Japanese ports in the early seventeenth century, largely on account of these countries’ eagerness to spread Christianity. Moreover it issued a ban preventing Japanese citizens from travelling overseas and decreed that ships from other European countries would henceforth only be allowed access to the ports of Nagasaki and Hirado. King James I of England had previously remitted a sovereign letter to Tokugawa Ieyasu in 1613 with the help of the Englishman William Adams. The official shogun at that time was actually Hidetada, but Ieyasu, though retired, acted as the de facto shogun. Ieyasu answered by issuing a Red Seal Permit affixing his signature, thus resulting in the establishment of trade relations between England and Japan and in the opening of an English trading post in Hirado. (The original Red Seal Permit is currently held in the Japanese collections of the Bodleian Library, Oxford.) However, due to a number of factors (such as rivalry with the Dutch East India Company) the English trading post in Hirado was forced to close ten years later. Subsequently, in 1641, the Tokugawa shogunate forbade all foreign trade through Hirado, thereby forcing the Dutch trading post there to relocate to the artificial island of Dejima in Nagasaki. In China, on the other hand, the Ming dynasty of the Han people collapsed in 1644 and was replaced by the Qing dynasty founded by the Manchu. The Ming loyalist Zheng Chenggong (better known as Koxinga) who was stationed in Formosa (Taiwan) had established the exile regime of the Han there in hopes of eventually reinstating the Ming Dynasty. In 1661 Zheng expelled the Dutch East India Company from Formosa, the Company’s base for trading activities in the region, and took up trade relations with England. In England, Charles I had been executed in 1649 as a result of the Puritan Revolution. When trade relations were established with the regime of Zheng in Formosa, Charles II – who had succeeded in re-establishing the monarchy in England – used this opportunity to claim that the Red Seal Permit Tokugawa Ieyasu had issued to his grandfather King James I was still valid. Thus in 1671, one year after the publication of the English version of the Atlas Japannensis, he sent out an envoy fleet to demand the re-opening of trade. The fleet arrived in Japan in 1673 but the Tokugawa shogunate rejected the English demand, resulting in the suspension of Anglo-Japanese trade relations until 1858. There is no proof as to whether Charles II ever saw theAtlas Japannensis himself. However the fact that Charles II sent a fleet to Japan in the year following the publication of the English version of the Atlas suggests perhaps more than a mere historical coincidence. When leafing through the pages of this book, one starts to imagine how it may have influenced Anglo-Japanese relations 460 years ago. Next time I look forward to introducing Engelbert Kaempfer’s History of Japan, the second oldest book owned by the Lisa Sainsbury Library.